Sheilin’ o’ Mark lies in the furthest reaches of Glen Mark at NO 337 827 and is seldom frequented save by coast to coast walkers and seekers after a quiet weekend. Sheilin’ o’ Mark is a single room stone-built bothy with a concrete floor. There is some basic furniture, including benches and a table, and a good fireplace, but the building is not insulated at all. There is no wood in the area, so it is a good idea to carry in some coal. The fireplace is a good one, recently installed after a stove proved impractical. There is a good stream just yards from the front door with clear water. There is no toilet here. 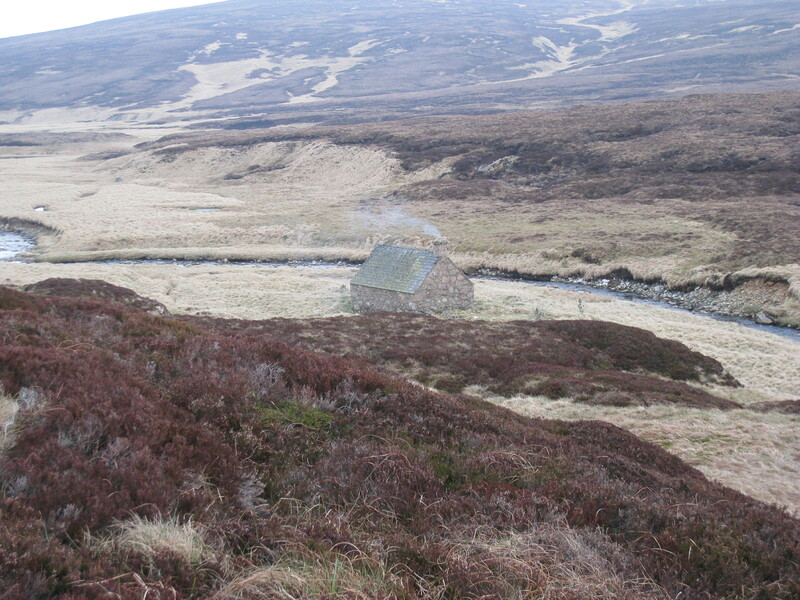 Take the bothy spade for a walk well away from the bothy and any running water. Visited it on a coast to coast once. None TGOC one mind you. Aye, it does seem to get a lot of its visits from TGOC folk. Lovely spot whenever you go there. Planning a stay there in May on my first TGO- Kenny very kindly says he’ll be there in advance wi coal! A true gentleman! Hope you enjoy, Stuart. Getting a coal delivery is the icing on the cake! Just needs updating to mention the stove has been taken out and its just the open fire now. Good point! Forgot about that. Hi … a friend gave me this link as I have a photo and couldn’t figure out where it was taken. It turns out it is Sheilin O’ Mark Bothy. Taken on a group outing in winter. Would you like me to send it to you? Always good to see a bothy picture. The Scottish Bothies Facebook group might be interested too. Had an overnighter here on a dreich weekend. First time for both of us. Braw wee bothy. We carried in 10k of coal so had a roasty toasty night. Definately no fuel in the area though. Got in without a problem but wouldn’t like to try it in the dark or in low mist. As it was we took bearings from the path end (y junction of streams) right to the bothy, just in case. You also need to trust your compass bearing as the bothy doesn’t appear until the very last minute!